The wording below has been taken from the information shown on this website in the TA Grut section. "We believe that Thomas Grut was apprentice to French photographer M. Andre who was listed in Carel Toms’ list of Guernsey photographers compiled between 1843 and 1910. Among the names of 70 photographers Andre is listed as living in 2 Victoria Crescent, Victoria Road in 1878. This is also the year that Andre photographed Victor Hugo. The other thing to note is that Victor Hugo brought over many prestigious photographers of the day to photograph him and his family and to teach his son photography. Hugo had his own dark room installed in Hauteville House and was very keen for his son to become a photographer. 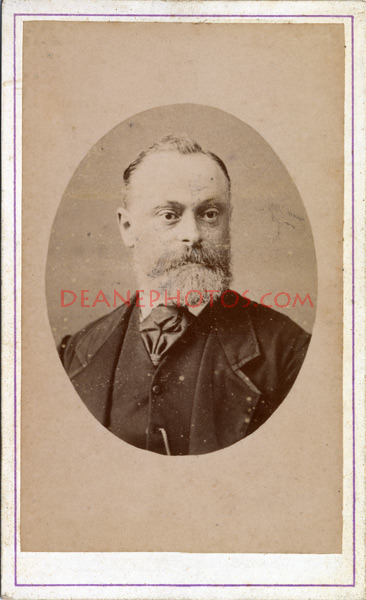 We do not know how long Andre was in Guernsey but we do know that by the following year, 1879, Carel Toms listed Thomas Grut as being an active photographer. We presume that Thomas had acquired the property as we found his calling cards that stated: ‘Photographie Parisienne Grut Late Andre listed at 2 Victoria Crescent Victoria road Guernsey’. We believe the ‘Late Andre’ was to alert the public that he had taken over the business and property from Andre, although ‘late’ could also have meant he had died. Later Thomas’s calling cards dropped ‘Photographie Parisienne’ and any mention of Andre. They stated: T.A. Grut 2 Victoria Crescent Guernsey."